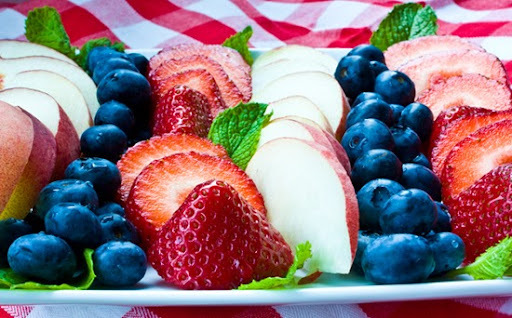 Happy Healthy HOT 4th of July! 7 Ways to Cool Off. Happy 4th of July everyone! Hope you are sipping, grilling, munching and crunching all your fave festive, healthy foods this holiday weekend. Beach-side, pool-side, park-side or city-side - take a few deep breaths today and celebrate with your favorite people and furry friends. 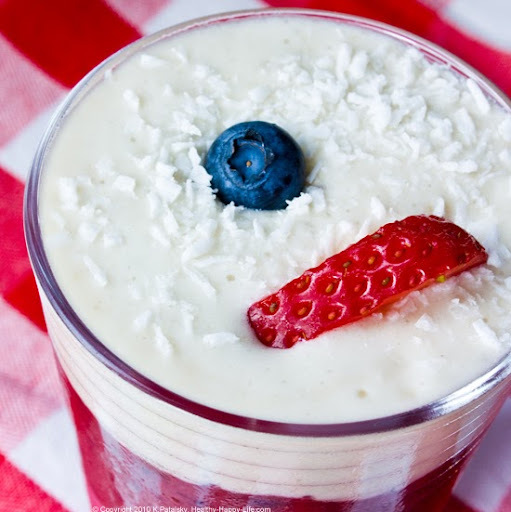 Seven Ways to Cool Off this 4th of July!! 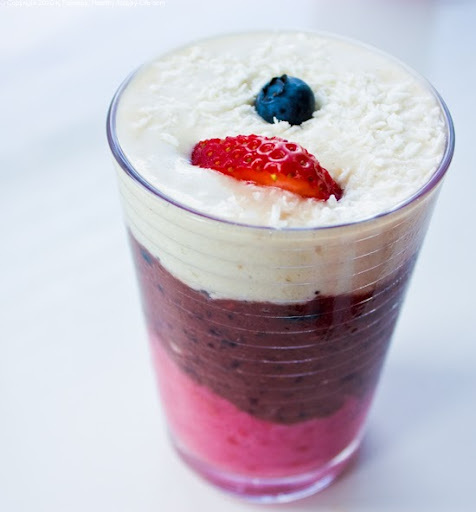 Blend up a fresh, fruity, healthy, happy smoothie with your friends and family today! And nix the same-old, same-old flavors. 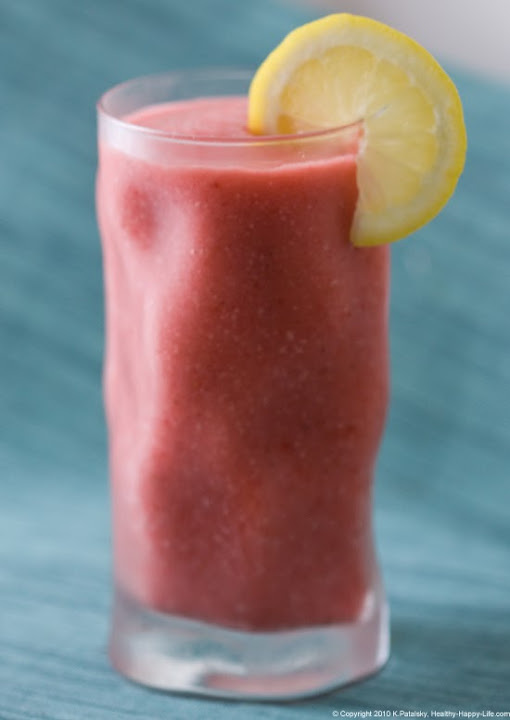 Try new vegan smoothie recipes like Calm Chamomile, Super Sinus, Razzle Dazzle Me, Triple Threat Acai, Strawberry Lemonade and Strawberry Short Cup! 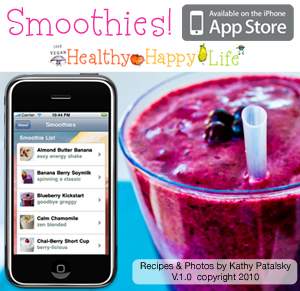 All these smoothie recipes are available on my Smoothies! IPhone App - recently launched. Buy it. 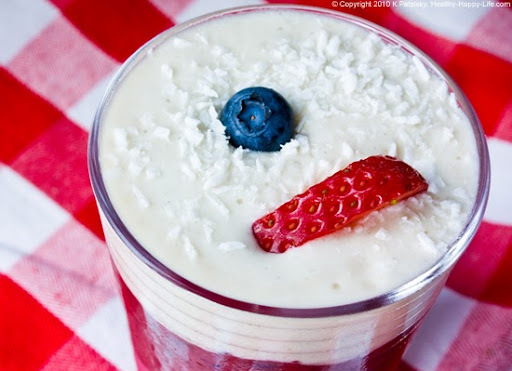 Or you can whip up this super festive Red, White and Blueberry Smoothie. Recipe here. Peruse my 100% vegan smoothie recipes in my drinks index as well. 2. Hot Cold Water Therapy. One of my fave wellness tips is Hot/Cold Water therapy. It awakens your body and gets your blood flowing. Such a refreshing way to end or start a busy day. But today, I'd do a lot less of the hot water, and more of the cold. Read all about Hot/Cold Water therapy here. 3. Coconut Water Ice Cubes. In your bevie glass or in your smoothie - coconut water ice cubes are a healthy way to stay hydrated and cool! You'll get a nice boost of hydration-helping electrolytes like potassium. Staying hydrated is important when you are outdoors in the heat, huffing, puffing and sweating on an active holiday. Coconut Water Ice Cubes info here. ...go for a banana split today, topped off with some rice or soy whip and vegan chocolate sprinkles. Happy 4th indeed!! Vegan Club Sandwich - Fit for Two! See my entire index of vegan sandwich recipes here. My favorite memories of the 4th of July are of walking down to the Santa Cruz California beach at dusk, cuddling myself under a squishy sweatshirt, plopping down on the cool sand to watch fireworks over the pier and roast smores with friends. A beach-filled 4th is still my favorite kind. And no, the beach isn't always the coolest place to park yourself during the day - but at night you can relax with a calming salty-wave of fresh sea breeze air. The sand will cool off and your toes can shed their shoes. If you can find a beach on the 4th - grab your spot on the sand - picnic in hand. Vegan Smores Recipe - with Sweet and Sara Marshmallows. Dandies Vegan Marshmallows - Review. If you can get to the Hamptons NYC-ers, go for it! Hamptons Bliss. Hamptons Guide. 7. 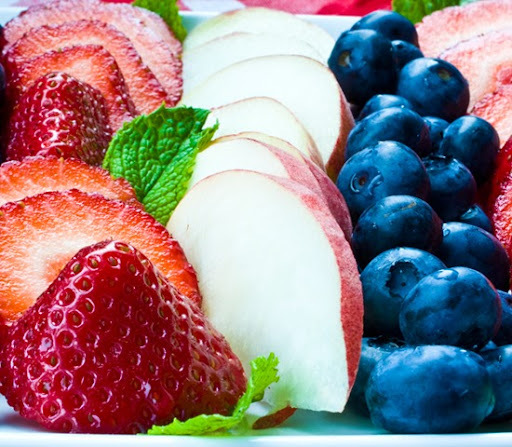 Cool off with Fresh Fruit! Healthy Happy Summer. Need more summertime eats ideas? check out my Healthy Makeover Summer Series! Featuring vegan recipes for your fave summer classics like hot dogs, giant pretzels, nachos, beachy pizzas and more! Happy, Healthy (Chill) 4th Everyone! My Smoothies! IPhone App: More info/Get it!